View of a two arched stone bridge in the county of Wicklow, Ireland. County Wicklow is famed for its beautiful landscape of mountains, valleys, lakes and rivers making it a popular subject for landscape painters. The artist of this work is Morgan but it is the engraver Francis Jukes (1747-1812) who is better known. Jukes, who was based in Holborn in London, became celebrated for the quality of his engraving and aquatint work. 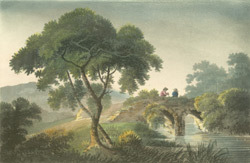 By the turn of the 19th century Jukes was working primarily on landscape paintings such as this one.